Nahlin is a yacht previously owned by the Romanian Royal Family. Nahlin is one of the last of three large steam yachts constructed in the UK. 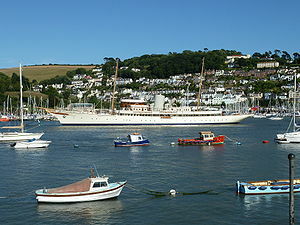 She was built for Lady Annie Henrietta Yule, heiress of Sir David Yule, was launched in 1930 and carried a crew of 58. Lady Yule ordered three small private cruise ships in 1929 from John Brown & Company, Clydebank with Nahlin being the first built. In 1934 Nahlin was classified as one of the biggest private cruise yachts ever built in the U.K. In 1936 Nahlin was chartered by King Edward VIII and used by him and Mrs. Wallis Simpson during their love affair. The yacht was bought in 1937 by the Romanian Royal Family and renamed Luceafarul, and later Libertatea. She was owned by the Romanian Ministry of Culture under order no. 3041, and in service as a charter yacht, a sailing museum of yacht building and development as well as a floating restaurant on the river Danube. After the Romanian revolution the yacht was sold to a privatised company and in 1999 Nahlin returned to British waters and today is registered in her home port of Glasgow. The Nahlin is 91.4 m (300 ft) long, and has a beam of 10.98 m (36.0 ft). Her draught is 4.42 m (14.5 ft) and is fitted with a propulsion system providing 2x200 hp, and a maximum speed of 17.1 knots. 17 July 2010: Dartmouth, Devon, UK, moored in the harbour. This page was last edited on 8 August 2010, at 12:52.